Chicken and Zucchini Enchiladas are a great way to enjoy Mexican flavors with the added value of hidden veggies. Added bonus, your family will never guess it's hidden inside the tortillas either! For a long time now, I have been a big fan of stuffing and hiding vegetables in dishes that normally do not contain them. This is one of those recipes. Zucchini is cleverly hidden in the stuffing of these enchiladas...not only increasing the nutritional value of them, but helping bulk up the meal so you can eat more for less!! ( money AND calories!) You absolutely cannot taste the zucchini in this dish. I bought a pre-made rotisserie chicken from my store ( for convenience) , and shredded the breast meat off of it for this recipe...but you could poach, roast, or use leftover chicken breast too. After shredding the chicken, I just grate the zucchini right on top, then set aside until I needed it. I like to add cheese to the filling of my enchiladas...I don't really know if it's the proper thing to do or not, but that is how I use up most of the cheese in the recipe. If you prefer, you could use all the cheese on top and omit it from the filling. One product I recently discovered is this Chipotle Salsa, which has basically the SAME ingredients as the Chipotle Peppers in Adobo Sauce, but the peppers are already ground up. If you have ever worked with the peppers in adobo sauce, you know it's a pain to finely mince up the peppers for recipes. This salsa kind of solves that problem. I just got this from my normal grocery store. I used whole wheat/low carb tortillas in this recipe, but you could use any tortilla wrap you like. likes how Old El Paso tastes, and you can't beat the convenience of just opening the can and dumping....but you could make your own sauce, if you wish. I served these enchiladas with low fat vegetarian refried beans and a veggie salad with Cilantro-Lime Vinaigrette . I found just one of these enchiladas was filling enough for me with the sides. I garnished them with low fat sour cream and some scallion, but neither is included in the nutritional information provided. My family really digs Mexican inspired recipes like this. If you do to, don't forget to check out these other recipes while you're here! Easy Mexican Chocolate Cake is always a hit and we never have any leftovers when I serve Cheesy Chicken Enchiladas Verde! Chicken and Zucchini Enchiladas are a tasty Mexican inspired healthy comfort food meal made with chicken breast, shredded zucchini, and low fat cheese. In a large nonstick skillet, sprayed with cooking spray, over medium heat, saute onion and garlic until tender, about 5 minutes. Add in the chicken, zucchini, chipotle salsa, cumin, and salt and pepper. Stir well. Add in the chicken broth, if needed, just to moisten filling. Turn off heat, and add in the cilantro. Set aside and allow to cool for 10 minutes. Preheat oven to 375 degrees F. Spray a 9 x 13" glass baking dish with cooking spray. Pour one can of enchilada sauce in bottom. Tip dish to coat evenly. To assemble enchiladas, take a tortilla and put approx. 1/3 cup of meat mixture down middle in a strip. Top with some of the cheese. ( divide the cheese evenly amongst the 8 enchiladas, reserving about 3 TBSP for the top) Roll up and place in prepared dish, seam side down. Repeat with remaining tortillas. Pour the other can of the enchilada sauce on top of the rolled up enchiladas. Top with the remaining cheese. Cover tightly with aluminum foil. My family LOVES Mexican dishes. Honestly, I think I make Mexican and Italian inspired dishes the most! Although I have no Italian or Mexican blood in me...basically all Eastern European! I do make a mean pierogi dish and love to make stuffed cabbages ( but they are a lot of work!) I dabble in Asian flavored meal and I am a complete novice with Indian cooking ( although I would like to learn more! ) What cuisine are you most fond of making for your family? 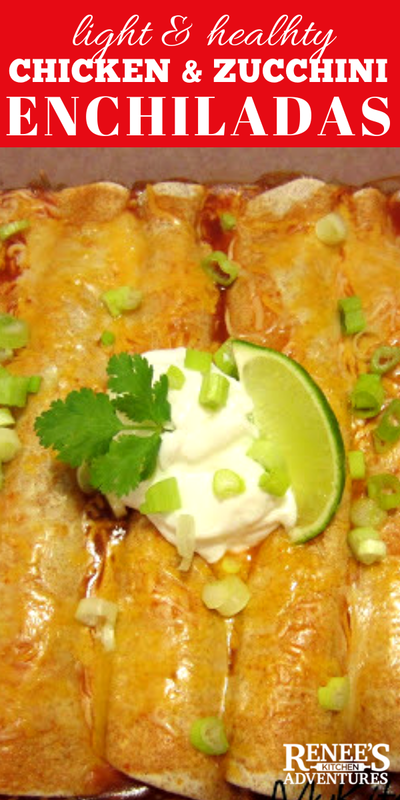 Pin Chicken and Zucchini Enchiladas! @ Nicole....my daughter...who eats NO vegetable, ate one. She noticed the green, but didn't taste it, so she went with it. lol IDK...you can see it, just can't taste it. Yummy!! I have chicken. I have low carb wraps. I have zucchini. I have salsa. I have cheese. Now I have my lunch idea for tomorrow - thanks Renee! Yayyy! I love adding veggies to all dishes. I totally agree w you that it bulks up the dish so you don't eat as much meat (and save money). Love the chipotle sauce! Hi Renee, love that you snuck the veggies in!!! :) I want to learn how to cook a bit more Indian food, we love it. But if I go out....I think Japanese is my favorite. Have a great week. Great tip about the chipotle salsa... I hate mincing chipotles in adobo! :) Looks yummy as always, Renee... wonder if I could trick DH into eating zucchini this way! I love Mexican food and the idea of the zucchini to bulk them up is fantastic! My garden is pumping out the zucchini...these look like the perfect way to use'em up!